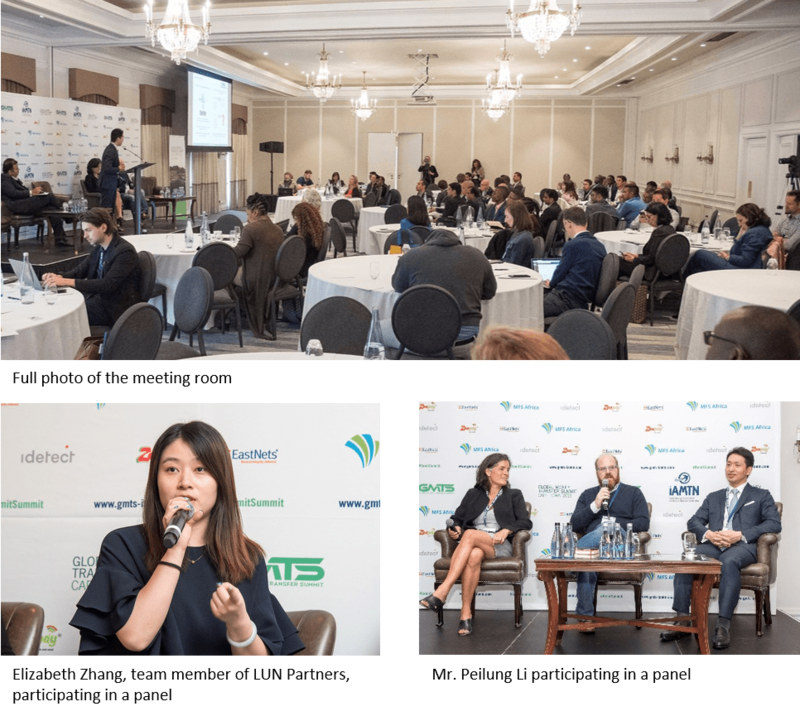 In March 2019, Chairman of LUN Partners Group, Mr. Peilung Li, was invited to present a feature keynote speech on “FinTech Horizons from Asia to Africa” at the Global Money Transfer Summit (GMTS) held in Cape Town, South Africa. Participants of the summit included world-renowned innovative financial technology companies, financial services firms, and top investment institutions, including MFS Africa (LUN’s portfolio company), Wari, Azimo, Mastercard, Eco-Bank, Postbank Uganda, Safaricom, MTN Group, Vodacom Group, Quona Capital, and Amadeus Capital Partners. All the participants provided keynote presentations and participated in discussion panels on subjects related to “Compliance Challenges”, the need for “Closer Relationships Between the Banking and Remittance Industries”, and the “Current State of Technology and Infrastructure” being developed to support financial services. This year’s GMTS was the first ever held in Cape Town, South Africa, and MFS Africa served as the summit’s primary sponsor. Throughout the summit, participants were able to refine their understanding and deepen their insights regarding regulations and policies, innovative opportunities, cross-border remittance services, local payment system, and the general money transfer ecosystem within the continent of Africa. LUN Partners continues to actively explore new investment opportunities within Africa and ways to contribute to the development of the FinTech industry throughout the continent. The Global Money Transfer Summit is the most recognized conference in the money transfer industry. It brings together innovators, disruptors and stakeholders to explore the challenges and opportunities in the remittance industry. The purpose of GMTS-Cape Town is to inform the money transfer operators, banks, foreign exchange house, technology providers and other delegates of the trends in the money transfer market. GMTS is organized by The International Association of Money Transfer Networks (IAMTN). Founded in 2005, IAMTN is a non-profit membership organization that works closely with governments, regulators, regional associations and all other stakeholders to champion the creation of the most effective, safe, reliable and efficient payment systems.